On the revised ribbon on the MAC, Microsoft designed a very interesting solution to represent a set of contextual tabs. 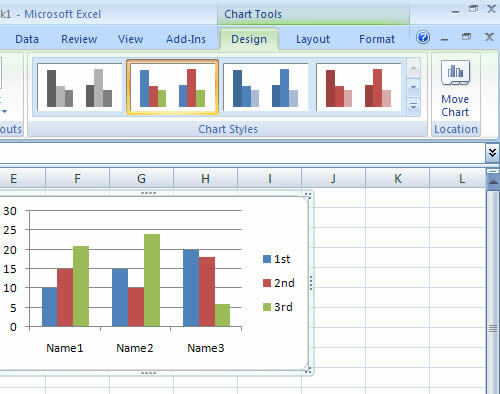 The Charts tab points to the associated Chart Layout and Format tab, representing the relation among them. A similar concept is represented in a slightly different way on Windows, which groups the contextual tabs adding a colorized section with label above the contextual tabs. I found the new solution on the MAC clever and potentially more elegant, but it is currently less obvious then the Windows affordance. The MAC solution would become much easier to understand if all Charts tabs were using the same purple color. The Charts tab now provide a mixed message to the user. It is visually grouped with the other tabs by using the color green. At the same time it is visually grouped with the purple tabs by using the pointy shape. Confusing.